How can your organisation support Smiles 4 Miles in your local area? DHSV partners with and funds a range of local organisations such as local government, community health services and primary care partnerships to implement Smiles 4 Miles. As a local Smiles 4 Miles partnership site, you are responsible for engaging and supporting early childhood services to implement oral health promotion activities and achieve their Smiles 4 Miles award. Priority is given to areas where children have a higher than average risk of developing oral disease. When considering where to fund the program, DHSV takes into account factors such as socioeconomic demographics, access to dental services and fluoridation status. 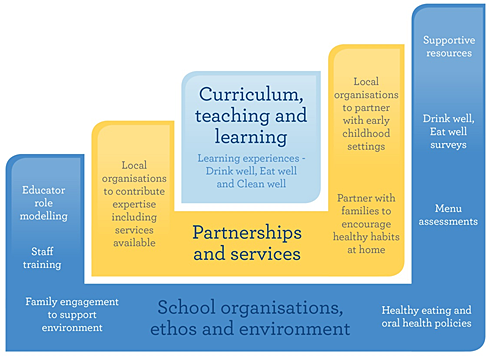 Figure 1: The Health Promoting Schools Framework and the Smiles 4 Miles program. For more information, or if your organisation is interested in participating, please email the Smiles 4 Miles team. 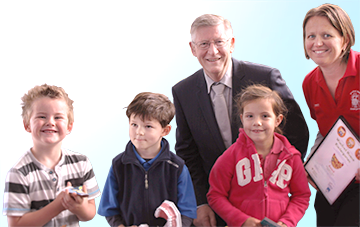 The Smiles 4 Miles program is based on the Health Promoting Schools Framework. This framework provides a supportive environment for learning and health through three key areas- curriculum, partnerships and school environments. Smiles 4 Miles offers a simple, evidence-based framework to create an environment that supports the health and wellbeing of everyone in the service. It helps services put in place simple strategies to promote good oral health and healthy eating habits among children, which supports and enhances existing structures, programs and practices. Click the [+] to reveal the list and [-] to close.